Who knew that Kris Aquino's estranged financial manager would reopen a gigantic can of worms? If there's such a thing as VP Leni Robredo's "well-oiled machinery", this must be it. If Pinoy Ako Blog's Jover Laurio sued Franco Mabanta simply for calling her ugly, why didn't she sue those who, as she claims, send her round-the-clock death threats? The anti-administration blogger Laurio has been literally telling the world that she eats death threats for breakfast, lunch, and dinner, yet why hasn’t she sued anyone for it, despite the fact that she has already sued others for far lesser offenses? Of course, threats against Laurio's life are far worse than threats against her ego, unless she believes her ego is more important than her life, which would necessitate Laurio's tacit admission that she's a moron and that will never happen. Laurio herself believes the death threats are all bark and no bite. Laurio believes the death threats are serious but she can't sue. If the none of the deaths threats Laurio’s been bragging about are credible, then Laurio is simply one big fat ugly lying megalomanic ogre. By virtue of the dismissed Laurio v Mabanta libel case, however, Laurio at the least maintains that she's not ugly, so the second possibility must hold, right? But why didn't she sue? Suing someone requires three things:  Means,  Motive, and  Opportunity. Assuming the existence of significantly grave threats, Motive is already present. Moreover, she can simply approach a state prosecutor to file a case, just like what she did in Laurio v Mabanta, so the Opportunity is there. With Motive and Opportunity present, the question is why she hasn’t sued people for grave threats can be simplified into a question of whether Laurio has the means or not. More specifically, does Laurio have the financial capacity to pay for the case filing fees, legal costs, and ancillary expenses associated with suing another person for grave threats? Apparently not, and there lies yet another seeming contradiction. Where did she get the money to sue Mabanta in the first place? Aside from Mabanta, she also sued bloggers RJ Nieto (Thinking Pinoy blog) and Sass Sasot (For the Motherland blog) for breach of data privacy, a civil case whose filing fee alone costs around Php 60,000 pesos? Where did she get the money for these two cases, and why can’t she get more money for a new one? In “#PABoost: There's another fishy thing about this anti-admin blogger's page financials” where Thinking Pinoy examined Laurio’s finances, TP explained that considering that she  claims to be poor,  lacks a donation link on her websites, and  uses no 3rd-party crowdfunding platform, she cannot possibly afford the costly advertisements she runs on her Facebook page. For one, she had at least 6 sponsored posts for May 2018 alone, and she’s running 3 sponsored posts as of 03 January 2019. The same article went on to explain that Jover must have one or more external political financiers, like a former president’s sister (READ: Kris Aquino) as shown in a leaked chat screenshot, to foot the bill for Laurio’s costly social media promotions. NA-BOOST KAYA NI NICKO FALCIS? Is it possible that one or more of the political financiers (e.g. Kris Aquino) who have been funding Laurio’s sponsored posts are also funding the legal battles that Laurio herself initiated and if so, why are they reluctant to finance a case against those who supposedly threaten Laurio’s very life? The skeptic (I encourage skepticism) may still insist that evidence pointing towards Laurio’s financial links to these politicial financiers is still lacking, given that what has been established to far is just Laurio’s financial links with Kris Aquino and little else. And that’s what we’ll tackle right next. Recall the Thinking Pinoy article “#CocoyGate: Senator Sotto, here's the guy you're looking for” that was used as resource material for an October 2017 senate hearing, which eventually led to the Philippine Senate issuing a subpoena against opposition propagandist and Aquino-era Presidential Communications consultant Edward Angelo “Cocoy” Dayao. The article demonstrated, among other things, that the Pinoy Ako Blog website (PinoyAkoBlog.com) and several other sites controlled by Cocoy Dayao run advertisements from a SINGLE Google Adsense Publisher ID, i.e. a SINGLE Google Adsense Account. Every Google ad shown on a webpage is linked to a publisher ID owned by the person who receives ad revenues. Thus, several websites whose Google ads use the same publisher ID (i.e. same Google AdSense account) are either owned or controlled by whoever owns that AdSense Account. 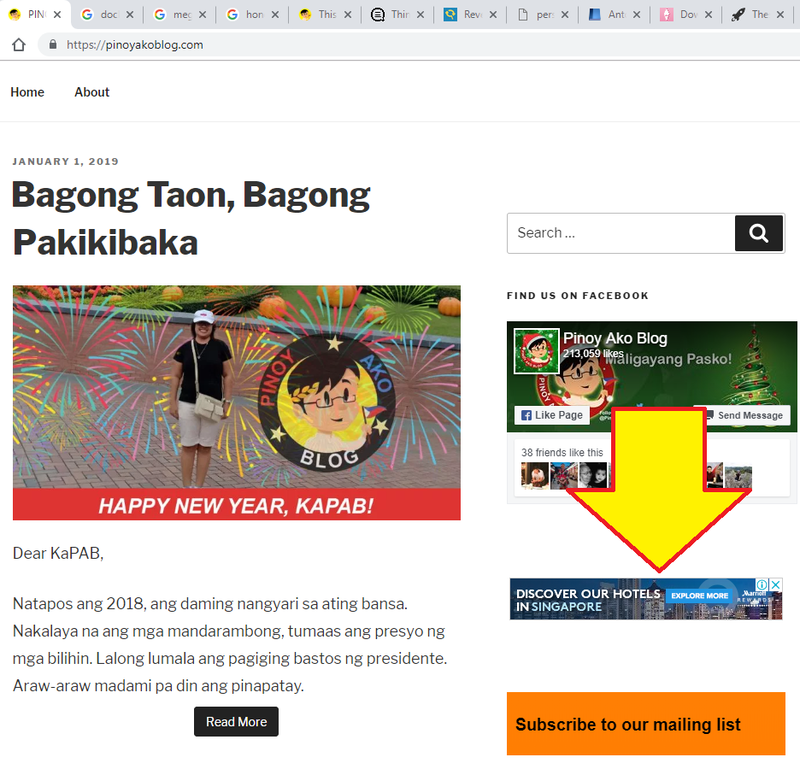 In the same article, I explained that in as late as 2017, PinoyAkoBlog.com shared the same AdSense Account (ID: pub-1068157602481996) as several anti-administration pages like ChangeScamming and BackroomPolitics. The websites have different writing styles. Simple content analysis will suggest that they are written by different people. Laurio manages to write only 20 to 30 short posts weekly on PinoyAkoBlog and judging from the quality and quantity of her blog posts, she cannot possibly handle all these websites. Laurio never claimed to have managed any of these other sites. Laurio claims to be a simple blogger, not a web programmer. Laurio managing so many sites by herself is illogical because it would destroy her supposed image as an independent honest-to-goodness political blogger. 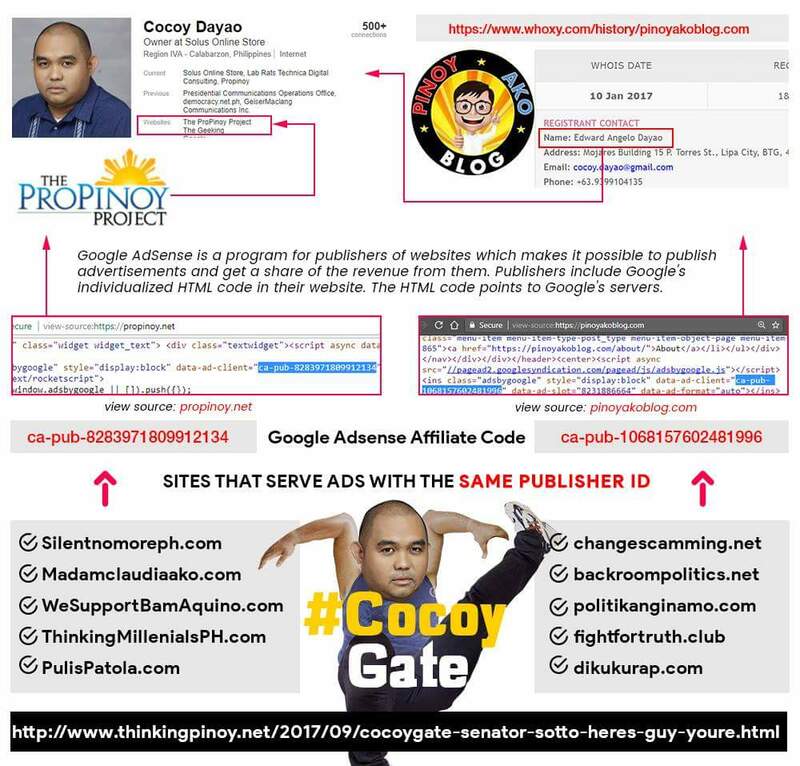 That is, Cocoy Dayao most likely owns the Google AdSense Account with Publisher ID “pub-1068157602481996”. Now, keep that last sentence in mind as we go to the next section. Out of sheer curiosity, the writer visited PinoyAkoBlog.com on 04 January 2019 at 1:00 PM to check if it still serves Google Advertisements… and still does. A screenshot of PinoyAkoBlog.com taken on 04 January 2019. It features a 320x100 pixel Google Ad (see yellow arrow). That is, a quick inspection of the ad served in an 04 January 2019 blog post yields the publisher ID “pub-1068157602481996”, or ads from THE SAME DAYAO-OWNED ADSENSE ACCOUNT mentioned in 2017. As of 04 January 2019, Cocoy Dayao still receives the ad revenues generated by Jover Laurio’s Pinoy Ako Blog website. In short, Laurio is still under Dayao as of this article’s writing… and who is Dayao under? SECOND, Dayao manages the official website of Liberal Party president and Philippine Senator Francis “Kiko” Pangilinan. Dayao himself admitted this in [Labrats], one of the websites Dayao owns. 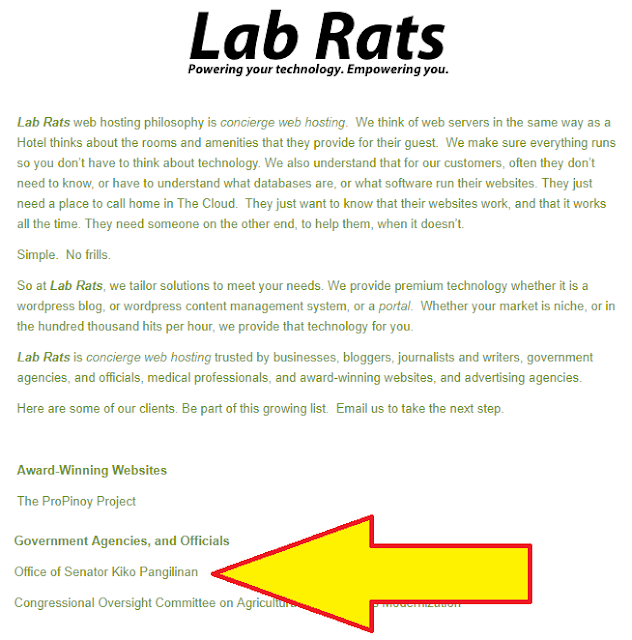 Cocoy Dayao himself admitted in his own website LabRats.me that Pangilinan is a client. That is, evidence suggests that Dayao is a Liberal Party lackey. Laurio writes in PinoyAkoBlog, PinoyAkoBlog is under Dayao, and Dayao is under the Liberal Party… and this still holds true as of 04 January 2019. 7. LP stalwart Imelda Nicolas, one of the central figures in “#LeniLeaks: Inside Leni Robredo's international propaganda machinery” and the sister of another LP stalwart billionaire Loida Nicolas-Lewis. 8. Senator Kiko Pangilinan himself, Dayao’s client and president of the Liberal Party. THE LIST OF THE VAST POLITICAL MACHINERY BEHIND JOVER LAURIO? 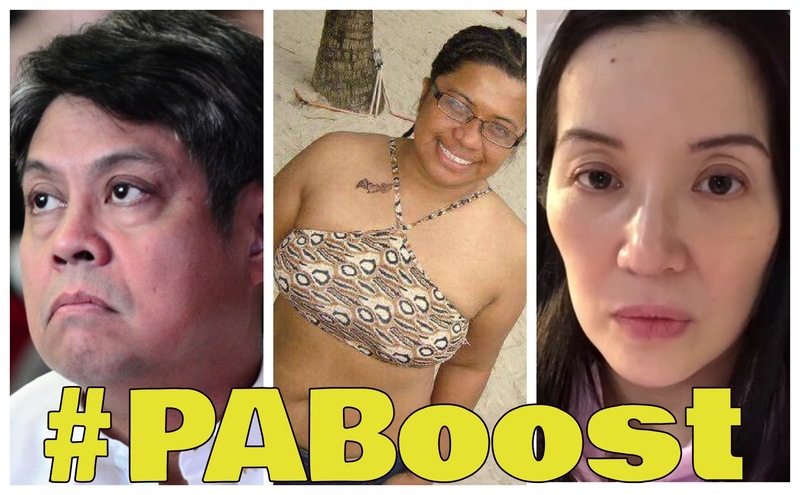 There’s a preponderance of evidence showing that more than just Kris Aquino, the Liberal Party itself has strong financial links to Pinoy Ako Blog’s Jover Laurio up to this day, contrary to Laurio’s claim that she’s just a simple, honest blogger. Simply put, evidence very strongly suggests that Jover Laurio, the Philippine Daily Inquirer’s Person of the Year, is nothing more than a Liberal Party-funded propagandist. Laurio is just one among many opposition bloggers and Pinoy Ako Blog is just one among many opposition blogs, so just how many opposition blogs receive financial support from the Liberal Party? When VP Leni Robredo accused the Duterte government of having a “well-oiled machinery” for propaganda, I can only surmise that she based this solely on the fact that her own Liberal Party has one, so that the other side must also have its own.